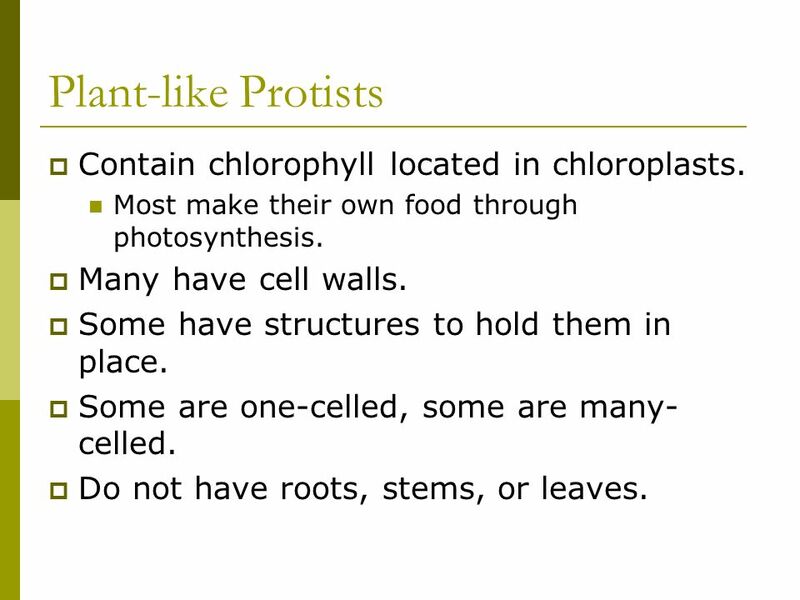 2 Plant-like Protists Contain chlorophyll located in chloroplasts. Most make their own food through photosynthesis. Many have cell walls. Some have structures to hold them in place. Some are one-celled, some are many-celled. Do not have roots, stems, or leaves. 3 Importance of Algae Phytoplankton (photosynthesizing unicellular algae) are the base of marine and fresh water food chains. Produce most of the oxygen on Earth through photosynthesis. Used as food and in industry. 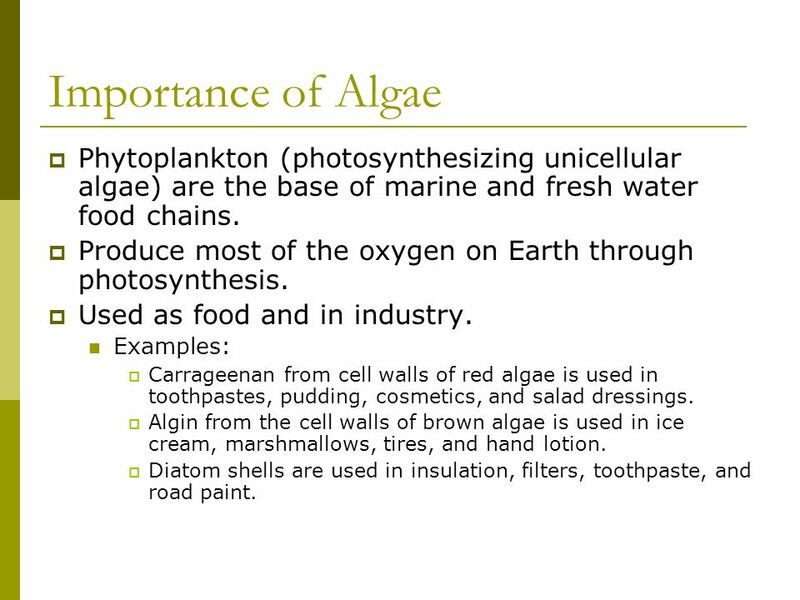 Examples: Carrageenan from cell walls of red algae is used in toothpastes, pudding, cosmetics, and salad dressings. Algin from the cell walls of brown algae is used in ice cream, marshmallows, tires, and hand lotion. 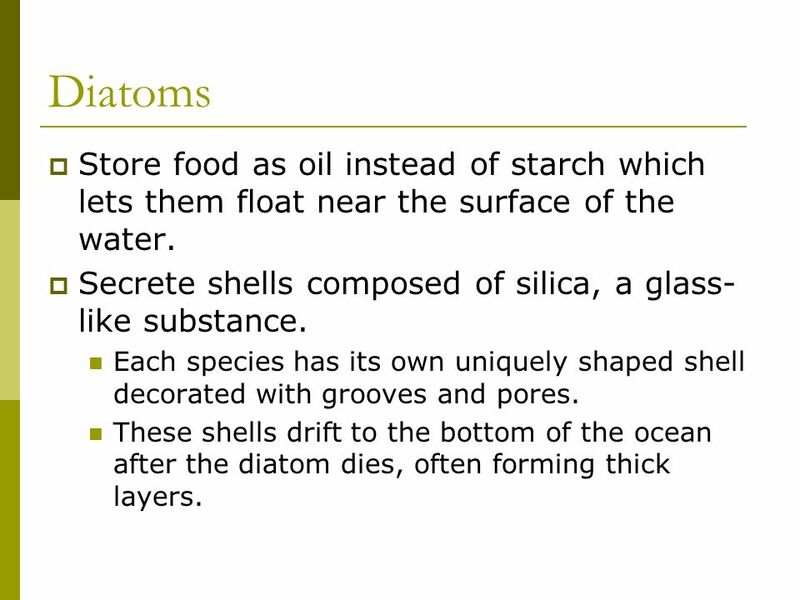 Diatom shells are used in insulation, filters, toothpaste, and road paint. Contain carotenoids along with chlorophyll. Gives them a golden-brown color. Found in both saltwater and freshwater. 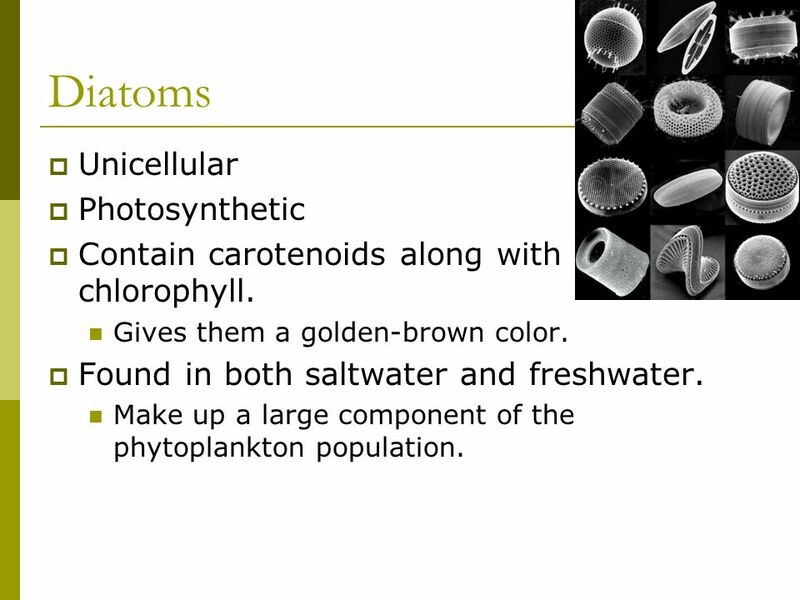 Make up a large component of the phytoplankton population. 6 Diatoms Store food as oil instead of starch which lets them float near the surface of the water. Secrete shells composed of silica, a glass-like substance. Each species has its own uniquely shaped shell decorated with grooves and pores. These shells drift to the bottom of the ocean after the diatom dies, often forming thick layers. 7 Diatoms Reproduce asexually by separating their shell in half and then producing a new half to fit inside each old half. This process produces offspring which are smaller than the parent cells. 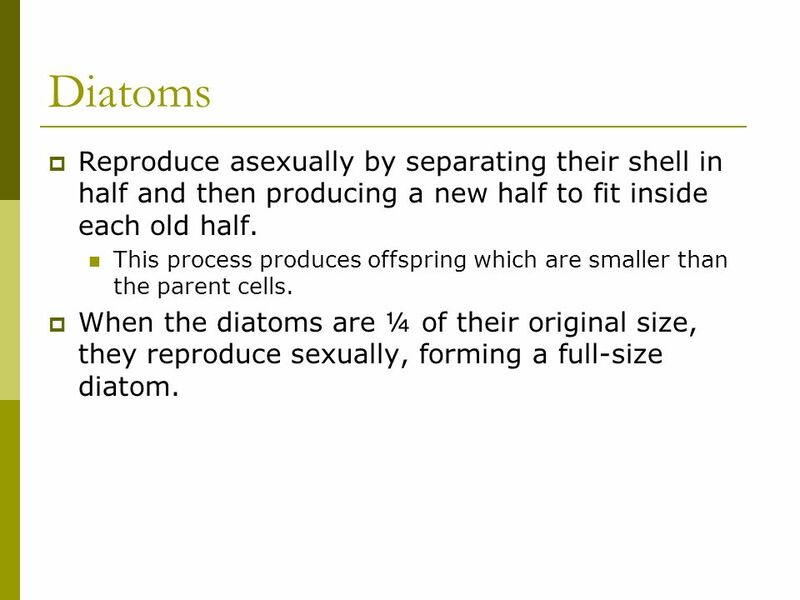 When the diatoms are ¼ of their original size, they reproduce sexually, forming a full-size diatom. pigments, along with chlorophyll. 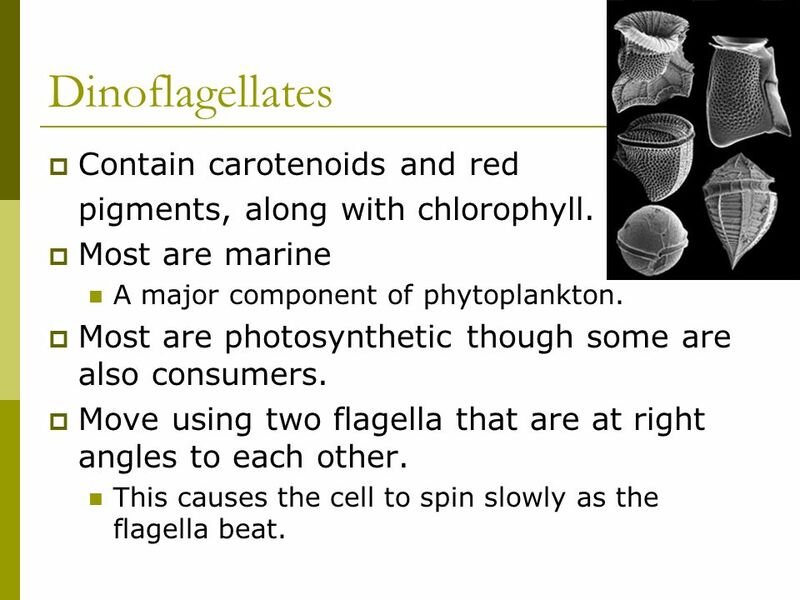 Most are marine A major component of phytoplankton. 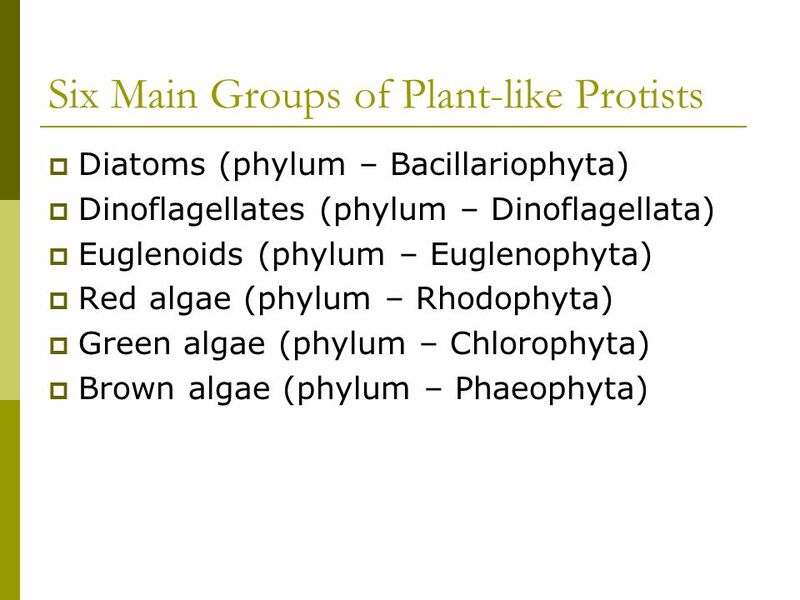 Most are photosynthetic though some are also consumers. Move using two flagella that are at right angles to each other. This causes the cell to spin slowly as the flagella beat. 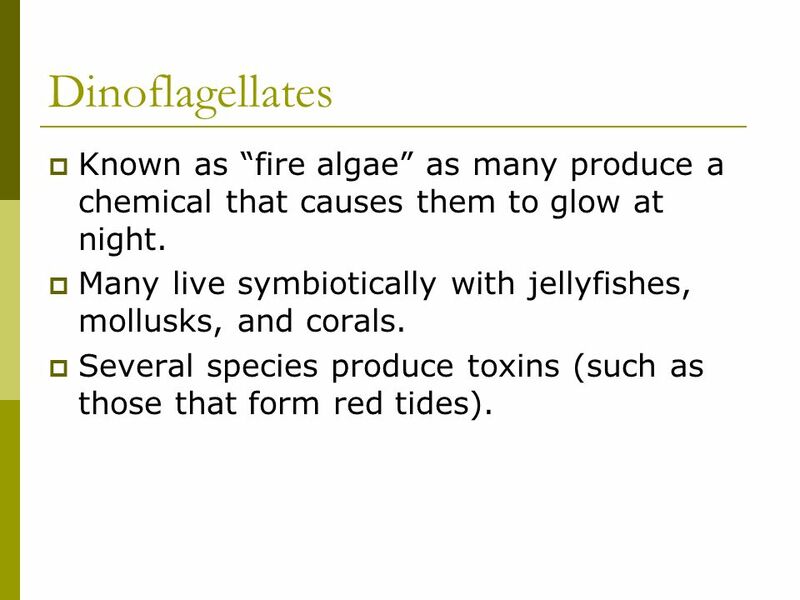 9 Dinoflagellates Known as “fire algae” as many produce a chemical that causes them to glow at night. Many live symbiotically with jellyfishes, mollusks, and corals. Several species produce toxins (such as those that form red tides). 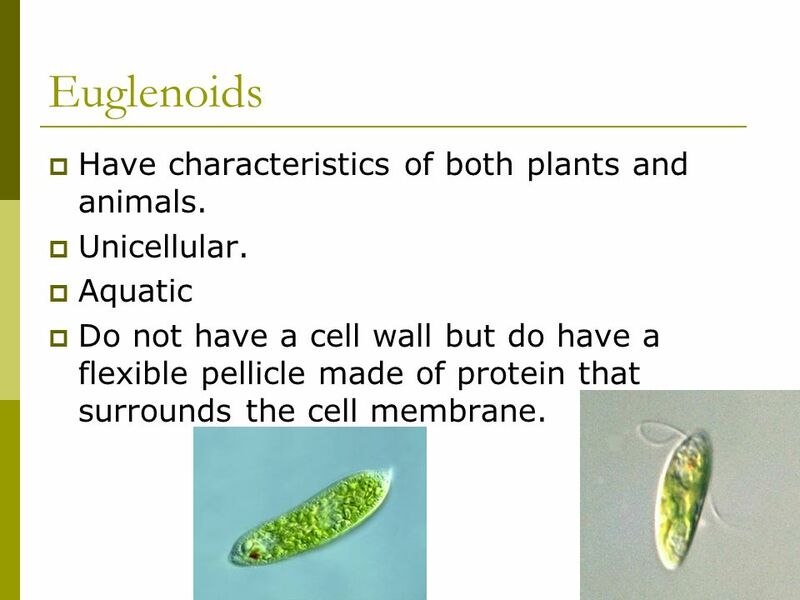 10 Euglenoids Have characteristics of both plants and animals. Unicellular. Aquatic Do not have a cell wall but do have a flexible pellicle made of protein that surrounds the cell membrane. 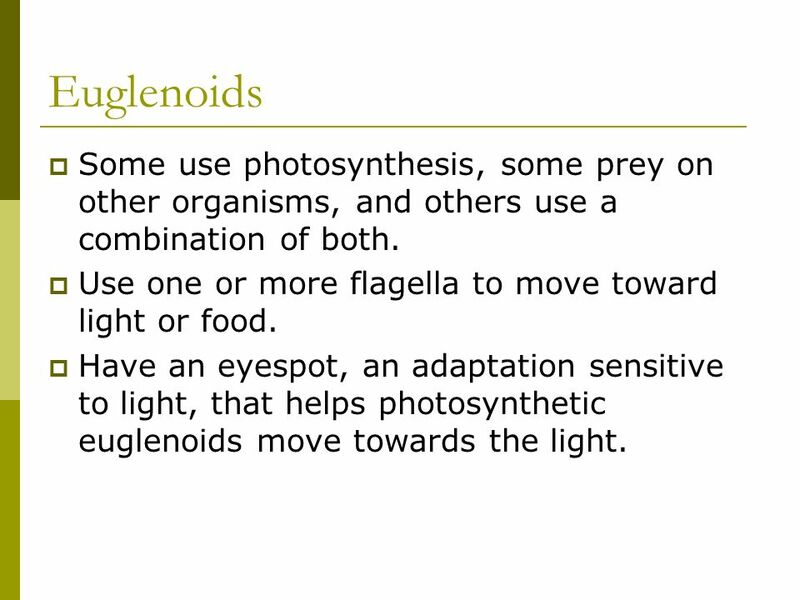 11 Euglenoids Some use photosynthesis, some prey on other organisms, and others use a combination of both. Use one or more flagella to move toward light or food. Have an eyespot, an adaptation sensitive to light, that helps photosynthetic euglenoids move towards the light. 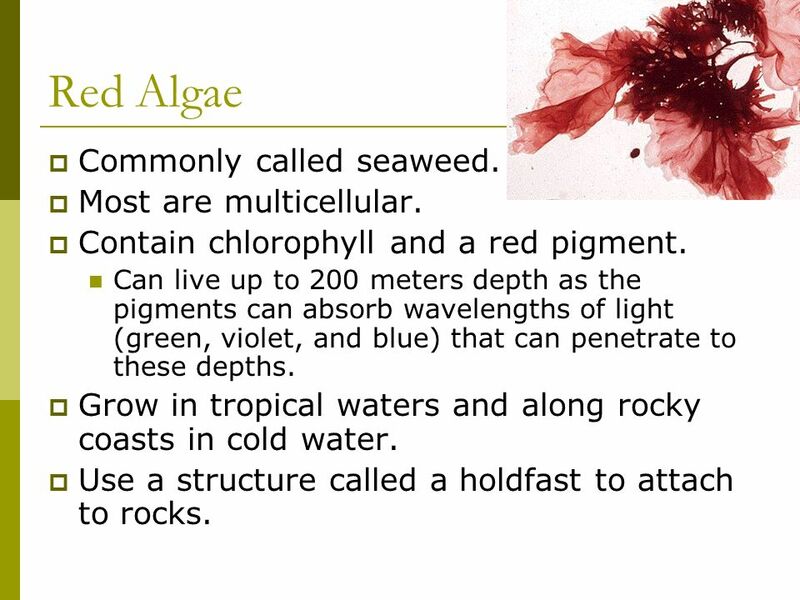 12 Red Algae Commonly called seaweed. Most are multicellular. Contain chlorophyll and a red pigment. Can live up to 200 meters depth as the pigments can absorb wavelengths of light (green, violet, and blue) that can penetrate to these depths. Grow in tropical waters and along rocky coasts in cold water. Use a structure called a holdfast to attach to rocks. 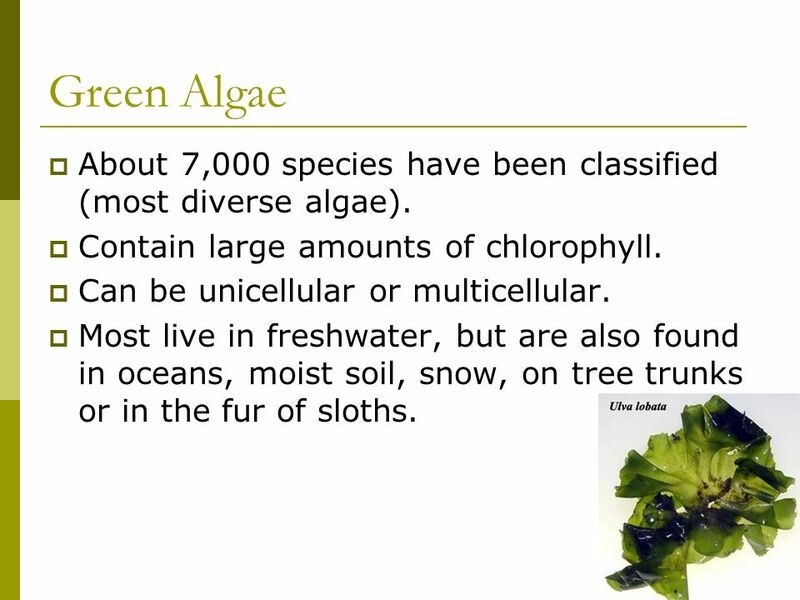 13 Green Algae About 7,000 species have been classified (most diverse algae). Contain large amounts of chlorophyll. Can be unicellular or multicellular. Most live in freshwater, but are also found in oceans, moist soil, snow, on tree trunks or in the fur of sloths. 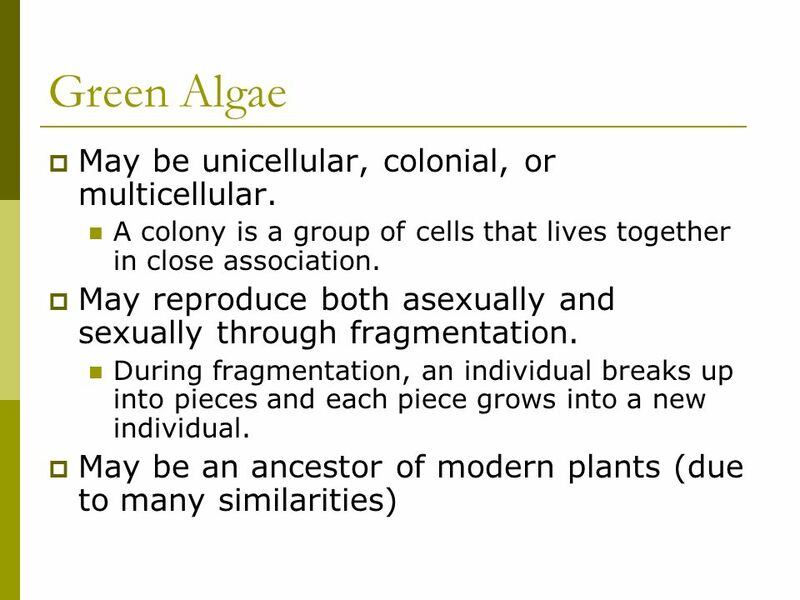 14 Green Algae May be unicellular, colonial, or multicellular. 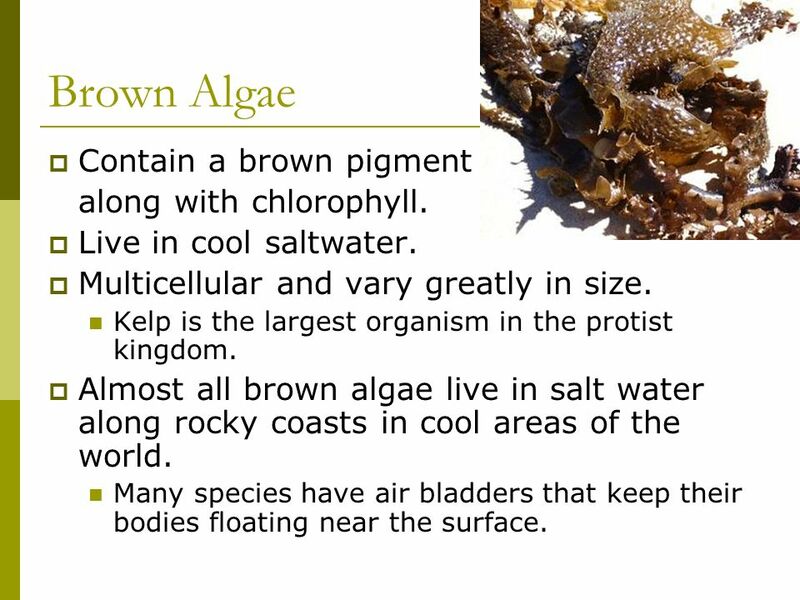 15 Brown Algae Contain a brown pigment along with chlorophyll. Live in cool saltwater. Multicellular and vary greatly in size. Kelp is the largest organism in the protist kingdom. Almost all brown algae live in salt water along rocky coasts in cool areas of the world. Many species have air bladders that keep their bodies floating near the surface. 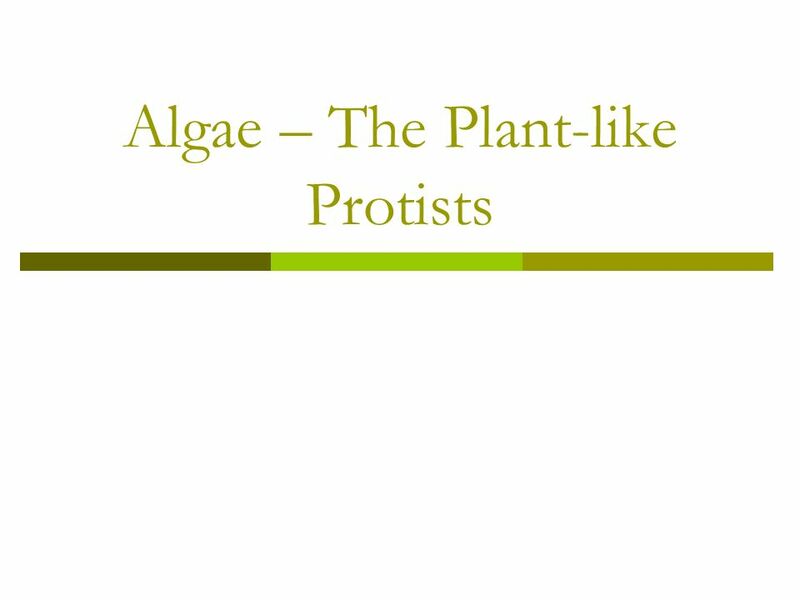 Download ppt "Algae – The Plant-like Protists"
Plant-Like Protists Biology 112. Algae  Plant-like protists  Contain chlorophyll and carry out photosynthesis  Many are highly mobile  Scientists. A Broadly Applied Name.   Algae are the ocean counterparts of plants, accounting for as much as 90% of the Earth’s primary productivity and oxygen production. The Kingdom Protista It’s A Small World! Click here to see a live protist. KINGDOM: PROTISTA Protists are unicellular organisms that have a nucleus. Kingdom Protista The Catchall Kingdom. Algae Characteristics of Algae Autotrophic Not plants – why? Often contain pyrenoids. Unicellular and Multicellular Organisms. Unicellular Organisms  Unicellular organism are one celled living things.  Algae are one celled organisms that. Algae vs. Plants. What are algae? Photosynthesizing protists. All contain up to 4 kinds of chlorophyll. Unicellular and multicellular. Primary Producers Plants and Plant-like Organisms. Protists. Characteristics Most diverse kingdom eukaryotic., 1.5 bya Primarily unicellular/multicellular, heterotrophic/autotrophic Usually asexual, some.